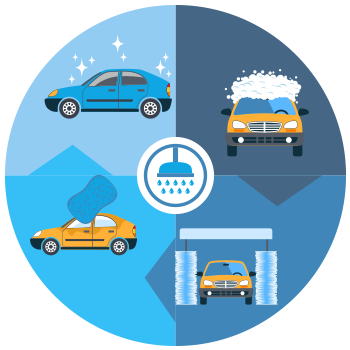 The Unlimited Wash Club is the best option for those looking to keep their car pristine-clean all year long. Enjoy as many washes as you like, even during the winter months. Become a member of our Unlimited Wash Club for only $29.95 a month! Join today and enjoy unlimited washes all month long! Yes! As a member, you can come in as often as you’d like, even multiple times in the same day. Is tire shine included with the unlimited program? No. Tire shine is an optional item for an added charge of one dollar. No. Westerly Car Wash offers a full serve vacuum option which includes windows for an additional charge of 15 dollars. Yes! Westerly Car Wash tunnel is a light touch car wash. Westerly Car Wash was also completely rebuilt with brand new MacNeil carwash equipment in 2013. Each time you wash your car with our Seaside Shine, your car is treated with Triple Foam Wax and Simoniz giving your car maximum layers of protection. No! Winter is the best time to wash your car. The salt on the roads eats into your vehicle’s paint and contributes to a decreased life of your car. We do close during snowstorms and when it is raining. ** Cannot be combined with any other coupons, promotions or discounts.